Inverter generators are top notch--quiet, compact, and able to charge the most sensitive electronics. We've created three best Top-10 lists for you to choose from: the best-selling, the top-rated, and expert-recommended inverters. 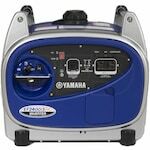 Browse our lists below and discover your perfect portable inverter generator! 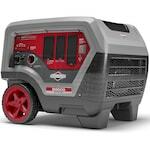 Also be sure to check out our Inverter Generator Buyer's Guide. High-wattage appliances, such as air conditioners, need more power when starting than when running. 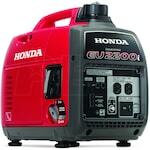 The initial surge of required power can be too much for some generators to accommodate. 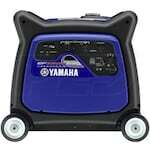 Some generators feature power boosts, which increase the power output by adding battery voltage to the alternator. The Boost Control Unit (BCU) senses when extra power is needed and boosts output for up to 10 seconds, giving air conditioners and other equipment the extra boost of power to start quickly and efficiently. Why would you want to walk all the way out of your recreational vehicle to have to turn on your generator? Well, if you buy a model with the remote start feature, you won't have to. 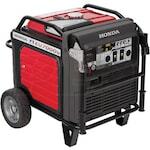 Just like remote start on a car, you just push a button and your generator will start running. This is purely a luxury feature, but you'll appreciate it when you need to fire up your generator in the middle of the night. Medium inverter generators are larger than other inverters, weighing between 120 - 200 lbs. With that being said, moving them by yourself can prove to be challenging. Some units come with built in wheels. This will make dragging them around your campsite much easier. More importantly, built-in wheels will save you money so you don't have to buy a wheel kit as well. Electric Generators Direct answers the question: What is the best inverter for you in 2019? 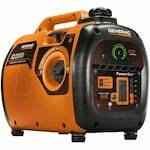 Our experts reveal a curated list of customer top-rated, best-selling, and expert-recommended inverter generators to help you find the perfect portable generator this year.